Isn’t that a beautiful machine? Delaugère & Clayette is one of, what I refer to, as the “French De’s” – a list of French automotive manufacturers including: De Dietrich, Decauville, De Dion-Bouton, Delahaye, Delage, Delaunay-Belleville and, of course, Delaugère & Clayette. Such an exotic-sounding list, isn’t it? Delaugère began as a carriage maker in the mid-1800s. Around 1898, they built their first powered three-wheeler and come 1901 they were an established automotive manufacturer. In 1904, Maurice Clayette joined the company named after Jean-Pierre Delaugère, the original founder, and the automotive concern was renamed Delaugère & Clayette. The 1920s were a struggle for the company and their factory was purchased by Panhard, with production ceasing in 1926. This is a model 4A. It uses a 6.3-liter four-cylinder F-head engine making 24 horsepower (Delaugère & Clayette produced another model using a 15.0-liter four-cylinder!). Double chains drive the rear wheels through a four-speed transmission. This car was completely restored about a year ago and it is stunning. The body is not original – it’s a period-correct replacement that replaced another non-original body that was on the car previously. This one looks better in black with brass trim. Look at where the engine resides – underneath that big, square black box with those big radiators out front held on with brass bars. It’s amazing to look at. This car is expected to sell for between $350,000-$420,000. For more information, click here. And for the rest of Bonhams’ Veteran Car Sale lineup, click here. 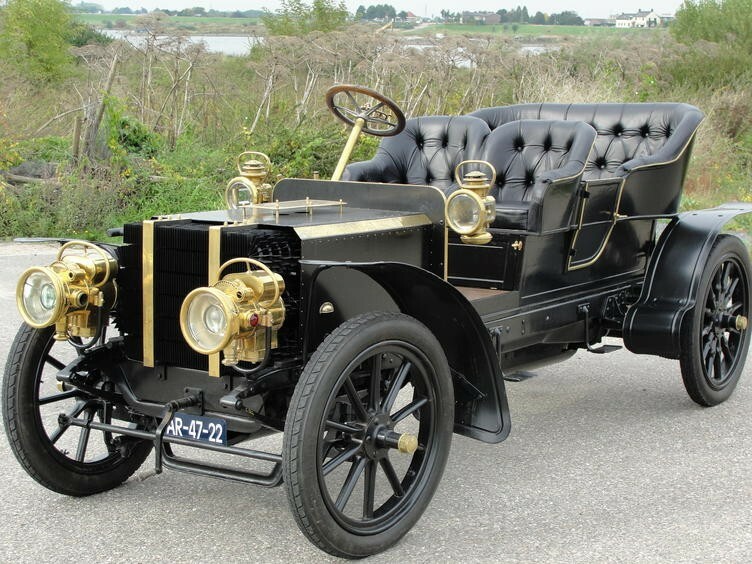 This entry was posted in Uncategorized and tagged 1904, 24hp, auctions, Bonhams, classic cars, Delaugère & clayette, four-cylinder, side-entrance, tonneau, type 4a by classiccarweekly. Bookmark the permalink.